this morning heralded the second (and third) events of the weekend. 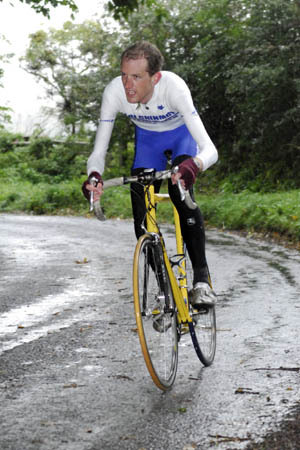 i started early — took my bike, to Weston-Sub-Edge for the Warwickshire Road Clubdouble hillclimb. In terms of the competition, it was an altogether more challenging affair, with a veritable glut of finely-honed (read: borderline underweight) racing cyclists. It’s a prestige event, and a chance for the contenders to check out the course for the National in a couple of weeks time, as well as lay down a marker. The first hill was long, nearly two miles, with lots of changes in gradient, the second – Dovers – was a steady climb, quite steep, with a fast finish. there were two hours between climbs, allowing time to sit down, cool down, have a coffee, a jam sandwich, before getting out and about to warm-up again for the second hill. a couple of things struck me quite forcefully today. there were a range of abilities and ages competing, all of whom were going far far away from any semblance of comfortable cycling. in some ways, it doesn’t really matter if you are fast or slow, riding upwards on a bicycle always feels slow; i feel i should be going faster, and become locked in mortal battle with my cadence, trying to eke out a few more revolutions, hoping i can change up a gear and my legs will not lapse into a crampy sulk. that’s it really, racing up hills is slow and painful, it’s an indescribable battle of will, seeing how far you can go before everything grinds to an undignified halt. in a double hillclimb the self-doubt is amplified with the waiting and the exertion. the inner monologue that accompanies the climb is something i may try to explain for you at a later date (coming soon! Inception! on bikes!). the first climb felt about right – not too savage. i spoke to tevjan (the winner) beforehand and on my way up i saw him coming down – he cheered me on, and i said thanks. afterwards we laughed about this and he said lightheartedly – and i knew it was coming – something along the lines of ‘if you can say thanks you weren’t trying hard enough’. which is very much the spirit of hillclimbs; catchers, retching and the unscheduled seeing of stars. incidentally, the giving of the prizes at haytor was delayed because two of the recipients were puking violently at the side of the road on account of their efforts. and possibly an ill-timed lunch to meet the 2pm start. the second climb felt better; for around a 100 metres or so. after this point the build up of lactic and the pain in my legs from my third hillclimb in 24 hours became suddenly, pressingly apparent. the sage advice given to me was ‘give this one everything because it’s shorter than saintbury’. which i duly did, throwing my ‘keep the pot boiling’ advice out with the bathwater. however, giving it everything is conditional on just how much of everything you’ve got. i had a small amount of everything, which just about got me up and over the 14% climb, i even got out of the saddle at the end for a reckless, jellied-eel of a sprint. and today, this evening, i am deliriously happy with pulsing endorphins. I came tenth in a race featuring elite riders and national champions. and as a postscript, there’s no logic to it. if i ride my bike a lot, and deliberately choose hills, and ride over them, and be careful what i eat, this is what happens. it’s not scientific. i appear to be quite good at riding upwards for lengths of time over 3 minutes, at steep gradients. it’s an odd talent to have. it’s not much use in the wider world; it is the most arcane and physically tough of disciplines. when struggling up toys hill 6 years ago with friends after returning to cycling, i would never, ever have thought that i had the capacity to achieve these kinds of results. there may or may not be a salutary tale there somewhere.